A new report from research firm IDC has smartphone manufacturers shipping 918.6 million devices in 2013. That would amount to 50.1 percent of all mobile phones shipped. A plurality of these smartphones will be bought in China, which has already surpassed the U.S. as the world's largest market for smartphones. IDC estimates that the 301.2 million total smartphones will ship to the Chinese market in 2013. The United States, United Kingdom, Japan, and Brazil are predicted to be the next largest markets. IDC notes that India, lagging behind other developing markets in smartphone adoption despite its massive population, represents a largely untapped market. Smartphone manufacturers, including Apple, have been moving to reposition their devices for affordability on the Indian market, with varying degrees of success. 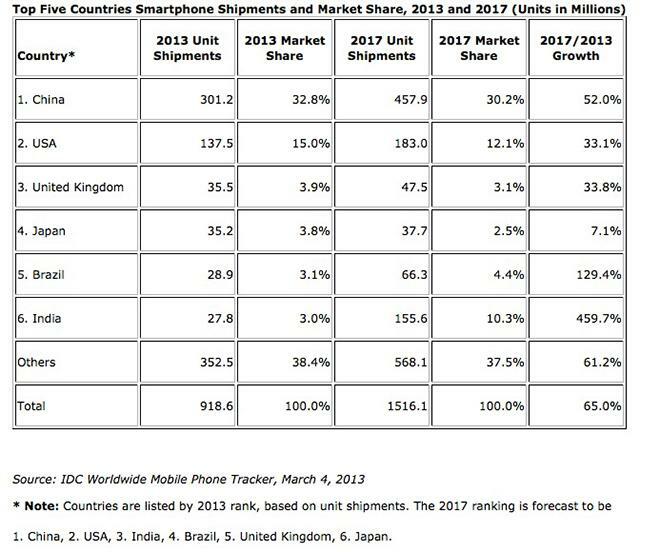 By 2017, IDC puts total worldwide smartphone shipments at 1.5 billion devices, about two-thirds of all mobile phones shipped. By that time, India is projected to be the third largest market for smartphones, behind China and the U.S and ahead of Brazil and the U.K.
Smartphone users currently make up the majority of mobile phone users in the United States, and IDC expects the market to grow slowly in that market for the coming years. Competition from new operating systems  including BlackBerry 10, Windows Phone 8, and others  is likely to be a main driver of U.S. smartphone market growth. IDC's report does not otherwise go into specifics regarding market share projections. Apple's iPhone offerings already occupy the top two slots worldwide in smartphone popularity. Together, the iPhone 5 and iPhone 4S account for 21 percent of all smartphones.